How do I Archive or Delete a User? When you archive a user, any past phishing campaigns that the user was a part of will still show the user’s actions. The archived user's actions will not be included in the reports for that campaign unless the Include archived users in reports field is selected in your account settings. However, if you delete a user, all of their phishing and training history will be permanently removed from the console. If you reimport an archived user with the same email, the user’s original training history will be brought back and any completed training content will reflect as though the user was never archived. Under your Account Settings, you can choose to enable or disable the Include Archived Users in Phishing Reports option. This option affects both the Campaigns and Reports tabs under Phishing. Navigate to Users tab > Users. Check the box to the left of the user(s) to be archived. Click the Archive button and select Archive selected. Archived users can be brought back at any time by reimporting them. Click the Archive button and select Bulk archive from CSV. The Bulk Archive Users window will appear. Click Browse... to upload a CSV file. Use the Notify upon bulk archive completion drop-down to control who receives an email notification of this action. Check the Send Bulk Archive Notification to option to send yourself an email notification of the bulk archive. Click the Archive Users button. Search for the archived users under the Users tab > Users. Check the Only archived users box. Click the drop-down to the right of the user. Every record of the user, including all phishing and training history, will be deleted. Users must be archived before they can be permanently deleted. Click the Bulk delete from CSV button. 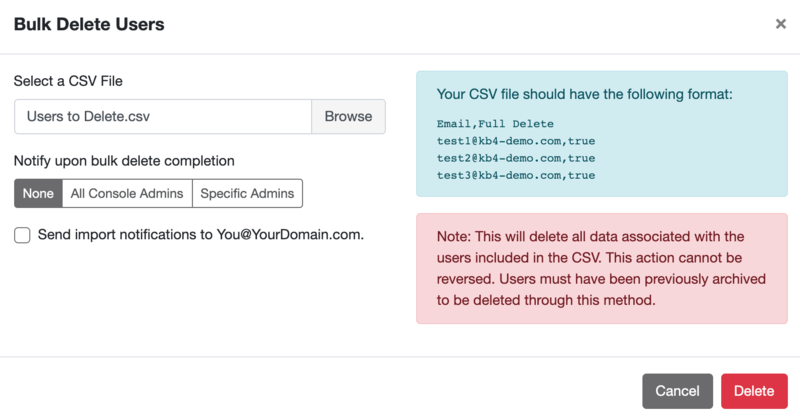 The Bulk Delete from CSV window will appear. Click Browse... to upload a CSV file. Use the Notify upon bulk delete completion drop-down to control who receives an email notification of this action. Check the Send Bulk Delete Notification to option to send yourself an email notification of the bulk deletion. Click the Delete Users button. Reimport the user’s email using the quick import function and the user will be added back to your users list with all phishing and training history accounted for. If you reimport a previously deleted user, their phishing and training history will not be accounted for. How Do I Add or Remove a User to or from a Group? What Can I Send to My Users After the Baseline Phishing Test Is Completed?